Review The SG41J1 is part of Shuttle's entry-level J series of barebones systems so you’ll be building this PC yourself. Provided you can live with fairly basic integrated graphics you’ll need to supply an LGA775 Intel Core 2 processor, DDR 2 memory, a hard drive and an operating system, plus mouse, keyboard, speakers and a display. The Intel GMA X4500 graphics that come built into the SG41J1 are fairly basic so you can forget about 1080p HD movie playback unless you put in a graphics card too. The GMA X4500 graphics core refused to complete 3DMark Vantage, and I recommend that anyone using the SG41J1 considers a £40 graphics card such as an AMD ATI Radeon HD 5450. You get an idea about the retro nature of the SG41J1 when you look in the package and find a bracket that carries a serial port and a parallel port. 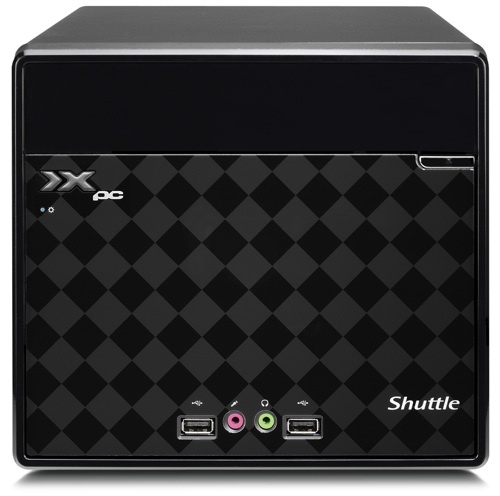 I tested the Shuttle with a 3.16GHz Core 2 Duo E8500, 4GB of 800MHz DDR 2, a Blu-ray Rom drive and a 30GB Kingston SSD drive and found the build was quick and easy. 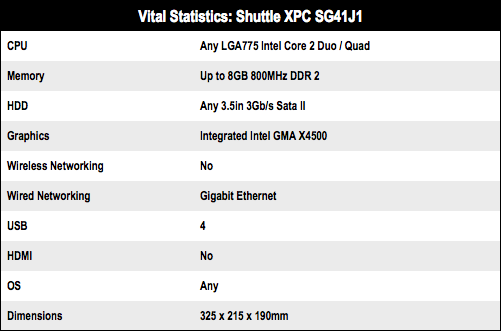 Unlike more expensive Shuttles, the SG41J1 doesn’t come with the company's quiet ICE cooling module. With no access to the back of the motherboard, a standard Intel CPU cooler is the obvious choice. In the test system, said cooler generated most of the PC's noise. A compact(ish) basis for a build-it-yourself mini desktop PC. Says this will send you to 'Trellotopia'. Seriously. Who writes this stuff?